At the moment, I am not using this on my forehead because I am trying to cure my forehead acne and congestion problem before applying any good stuff on them. Thus I have been applying this on my U-zone mainly, chin and a little on my nose. This serum has a light-watery consistency and it absorbs almost immediately into the skin once applied. Though, the thing that I like most is that it doesn't leave your skin feeling physically dry, it does have a thin layer of moisture you can feel on your skin. 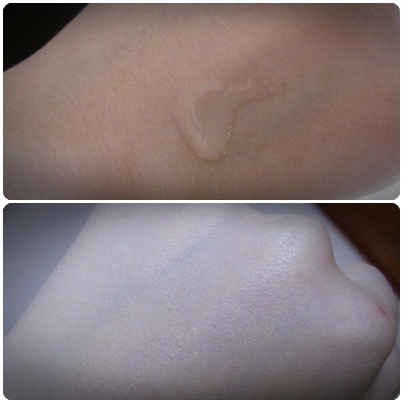 It is not oily or sticky, it is just a nice layer of moisture on the skin. It didn't break my U-zone out and it does have a pretty nice scent to it. I also applied it on my neck because that is where people tend to forget that neck shows your age if it is not well protected. My cheeks are more supple and my smile lines in between my cheeks & lips is less obvious now but I don't see much changes at the area around my eyes yet. I wouldn't really know if it does extend your youthful looking skin but in general, if you do take good care of your skin now, mostly likely you will end up with good skin when you grow a little older. I think at my age, the early 20s is the best time to start investing in good face products. I love anything that comes in pumps because it is more hygienic and easier to travel in different altitude. Especially I go up & down the hills quite a lot, most of the non-pumps skincare always oozes out all my precious products when I am up on the hills. It's annoying. This product has a good glass packaging and is in a good size. Sorry of the difference in color but I just want to show you the nice moisture it leaves on the skin. Thats why I always squeeze my tubes a bit before going up Genting xD First time was a lesson! I had a chance to try this product, and it actually helped clear up acne issues I've had for years! I wouldn't shy away from using on your forehead- it could be just the ticket! My skin dry acne problem it's good for me?